With heart in mouth I watched as CT picked a recipe for this month’s Random Recipe challenge, created by the dastardly Dom of Belleau Kitchen. This month we get to randomly pick any book in our collection and then randomly pick a recipe from said book. In my case this means a choice from my nine and a bit chocolate books, rather than my whole collection. CT always does the honours so that I am unable to cheat. He’d already picked the book and it was the one I was most dreading, although I was also rather curious. I was given The new taste of chocolate by Maricel E Presilla many years ago and I have never made a single thing from it. Now why is that? It’s a lovely book and I enjoy reading it. It’s subtitle is: a cultural and natural history of cacao with recipes and that is what it is. Maricel was brought up in Cuba where cocoa was grown on the family farm. She gives a personal and informative account of the subject and there are many interesting pictures to peruse. The trouble starts when it comes to the recipes. Not only are they in US measures (and I do not get on with cups) but they are rather on the extravagant and complicated side. These two factors have combined to keep the book well clear of my kitchen. Thankfully CT picked a recipe for Flo Braker’s Tropical Night Brownies, which meant I had only one of my two aforementioned aversions to cope with – brownies are comfortingly easy. Perhaps, I was being a little harsh after all, Dom is a genius and his random recipe challenge is great fun. Even if I’d wanted to, I wouldn’t have been able to follow this recipe exactly. One of the problems with using cups as a measurement is that there is no standard UK equivalent. Every conversion table I’ve looked at gives a different result and who has a conversion for cocoa nibs? But apart from differences in the quantities used, I omitted the cocoa nibs as I had a bar of chocolate containing them that must have been waiting for just this occasion. I also used spelt flour and substituted vanilla sugar and some vanilla chocolate for the vanilla extract. Roasted 2oz cashew nuts in the oven at 200C for 10 minutes until golden, then chopped roughly. In a large pan, melted 5oz unsalted butter with 5oz cocoa nibbed chocolate (77%) and 2oz 85% dark chocolate. Stirred in 4oz vanilla sugar and 6oz soft brown sugar. Left to cool for 5 minutes then beat in 3 duck eggs and a tbsp rum. Stirred in 2oz desiccated coconut and the cashews. Poured into a 9″ sq cake mould and baked at 180C for 17 minutes. Sprinkled the top with icing sugar. Cooked to perfection (not something I always manage with brownies), these were dark, lush and delicious, especially warm from the oven where I just couldn’t help myself! They had a fragrant flavour which I can’t quite describe but CT thought it was fruity. They were wonderfully chewy, had a nice crunch to the top and were altogether addictive. I shall be making these again. Your Brownies look delicious. I know what you mean about cups. I never got on with them but now I have bitten the bullet and just gone with the cups thanks to two little pyrex measuring jugs from Tescos.LOL They seem to work. Coconut and cashew in a brownie sounds delicious! I bit the bullet and bought a cheap set of metal measuring cups from Sainsburys and they are great for measuring things like popping corn and nuts but not so much for flour and icing sugar! Well despite your obstacles these look pretty fantastic to me. I share your dread though as Hubby is picking the book for this month’s challenge for me too! Like Hanna, I just can’t get on with measuring cups of flour and sugar – it’s so messy compared to weighing. I convert using a set of conversions which have always worked for me, and don’t even need to look up the basic ingredients now. The brownies sound very tasty! Ohhh, these sound great Chele! Were they like a combination between a bounty brownie and snickers brownie!? you’ve just reminded me to buy some cup measurers- there are so many great recipes I’m put off baking because I’m a but rubbish at all the coverting! These look delicious, so rich and moist and yummy. Being Australian, I am happy using a mixture of cups and weights, but going into American recipes where the cups are a bit smaller throws me right out! By the way, I love how i’m dastardly one minute and then a genius the next… i think you’ve summed me up quite neatly. oh and go and buy yourself some blinking cups for goodness sake! looks fabulous and such a nice flavour combination. very different. yum! Another one in the disliking cup measurements camp, so good on you for tackling this one! They look great, and the flavours sound really intresting, glad to know they are good. It sounds like a really interesting book too. I used to think it was just me who didn’t like cup measures but I see I’m not alone! 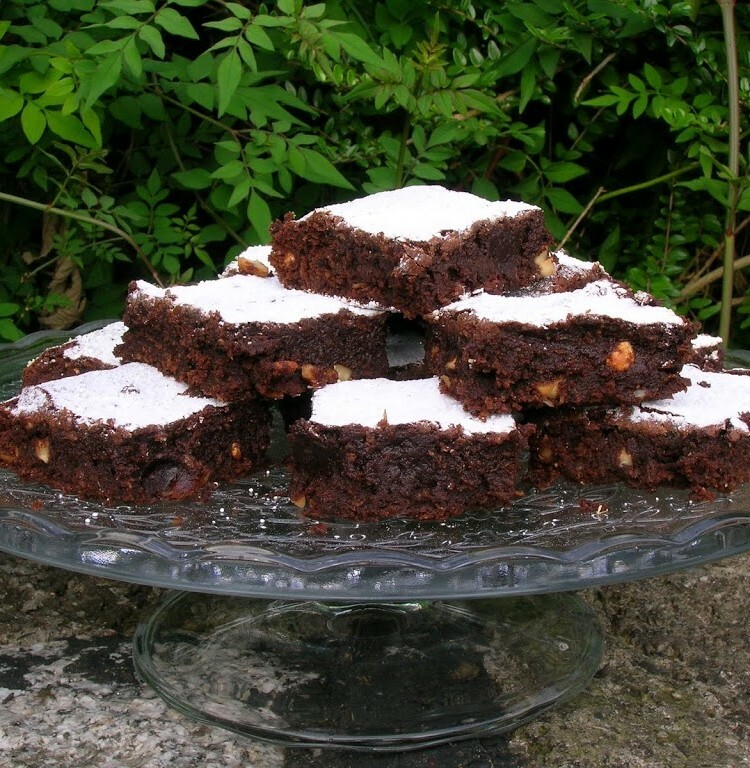 Love the sound of these, I’d never have put cashews in a brownie but I’ll try it next time. No idea what Himalayan pink salt is so I’m off to google it! How unusual and delicious. I’m with Dom – buy the cups! I bought my first set in 1980 in the US, they were plastic and lasted until two years ago. I now have a lovely stainless steel set that should last forever with any luck! Yum. Love all those flavour combinations. Lovely and what an inviting photo that last one is! Looks great! I always look forward to your random recipe challenges. I’m with you on the cup measurements – I bought a set of cups and weigh it out so I know how much to use next time. Rhyley’s Granny – I guess I should try, but I have a stubborn streak that doesn’t want to play. Hanna – Yes, it’s things like flour that puts me off, especially when I always use a mix of flours – scales are so much easier. Suelle – I guess that is the key, just use one set of conversions and stick to it. Trouble is most of them don’t go into enough detail. Kate – surprisingly they didn’t taste that bounty like, but they are up there with the top brownies I’ve ever had. Chele – he he. Dom doesn’t call it a challenge for nothing. Good Luck. A Trifle Rushed – now that is a good idea and such a simple one. I should get myself better organised. Foodycat – I didn’t even know Australians used cups and if I’ve seen them used on blogs just assumed they were using American measures. Thank you, that’s Interesting. Jac – thank you, it’s one of CTs favourite combinations. Dom – fennel and rose sounds really interesting – can’t wait for your verdict on those. the oven can’t be too far off now. My stubborn streak has come to the fore with regard to those darn cups! WLM – Thank you. I was a bit dubious about the cashews, but they worked really well. C – the great thing about this challenge is that it has made me revisit this book and it is well worth the read. And the brownies wereworth the headache! Janice – the camp is definatley split on this cup issue! CityHippy – these have got to be one of the best brownies I’ve made so far. CC – Coconut and chocolate is a lovely combination – I’m still not sure about pineapple. Baking Addict – now that is the most sensible suggestion yet – I can see I might just have to buy my self a set of cups after all – hummmm! I love cup measures but I know what you mean about translating them – I have trouble with this sometimes because Austalian cup measures are different to American ones – just to confuse you further! Are these the ones you said might be your best ever? Dastardly Dom ……I love it!!!!! They look fantastic – lovin that combination. You can buy a set of measuring cups in our local £ shop for next to nothing!! Hungry Hinny – these were very very good and close to being the best. I haven’t yet posted the ones I was talking about. I think the only real answer is to have a brownie fest so we can try a little bit of loads of them – surely then we will find the very best brownie -hmmm, now there’s a thought! BVG – ha ha, he didn’t seem to mind! Since writing this post, a very kind person (to be revealed at some point in the future) has sent me a set of measuring cups – so guess I better just try using them. Thanks for the conversion for us. I hate cups etc too. I think you can have American cups and other cup sizes too. Have just read online – ‘U.S. measuring cups and metric measuring cups may be used as equal in practice.’ There’s so little difference between them apparently. Your brownies look nice.